RARE India is aiming to be a collection of 50 hotels – fifty of the top boutique and concept hotels. Those who know RARE, know that our hotels are not just any hotel, but a carefully audited and curated collection of some of the finest boutique hotels, lodges, camps and retreats we have in India. Add Nepal and Bhutan, the potential to design programs across borders based on art, science, history, community, conservation, cuisine are manifold. We bring to you our best programs that can show case India by creating immersive programs with highlights that include meeting interesting people with a mission, encountering great stories of innovation and sustainability and seek living cultures, behold dying arts and crafts, delve into the world of spices and food, film and photography and endless explorations. Many of these programs have been validated through personal familiarization trips, organized FAMS, media visits and programs run on exclusive brochures. RARE ran two successful FAM programs for bespoke tour operators beginning in Chennai and ending at Cochin. A signature program combining two cultures and two topographies taking you through Villa Shanti ( Pondicherry ) for a glimpse of a life in a French Colony still existing on the fringes of Tamil culture , Svatma ( Tanjavur ) for an immersion in arts, crafts, music and cuisine , *Rajakkad ( Palani Hills, two hours from Madurai ) to literally relax, catch your breath and update your travel journals. Picturesque Anantya ( Kalayil ) to access Kanyakumari and Padmanabhapuram Palace is followed closely by a near private beach in Niraamaya Surya Samudra ( Kovalam ) with one of the best spas in southern India and Windermere Estate ( Munnar via Cohchin ) for an authentic plantation stay. Do not the two destinations that subtly intertwine the best of Tamil Nadu and Kerala to present an intriguing combination of architecture, cuisine and landscape. Driving south-west from Delhi this itinerary takes you into Shekhavati as you walk the heritage lanes close to Malji Ka Kamra, Churu, the virbant city of Nagaur where the fort’s restoration spanning twenty years is a living histoy at Ranvas . Further west to Jodhpur to live in the stepwell square within the walled city at Raas, Mehrangarh fort in constant view. Don’t forget to step up the adrenalin on an Overlander Overdrive for a day before you head to the tranquil shores of a reservoir in the handcrafted tents of Chhatra Sagar. on to a heritage home in Chanoud Garh to live among the wilderness of the Jawai forests among Leopards and Shepards at *Bera Safari Lodge. Head south as you proceed towards Udaipur, to enjoy the colonial ambeince at Mountbatten Lodge in Ranakpur and finally to end at the chic luxury of the hill fort, brougth back to its original radiance as *Raas Devigarh. Udaipur to explore or shop is less than an hour away. Ramathra Fort can add some wilderness, spice and starry skies to an otherwise regular golden traingle where in Jaipur - Narain Niwas Palace, Castle Kanota and *Khas Bagh can offer different and unique expereinces. Continue towards central Rajasthan via Ranthambhor ( two hours from Ramathra Fort ), to live among the erstwhile royal family in Shahpura Bagh, the luxurious homestay in the midst of many lakes, big and small. Proceed futher south to explore the medieval elegance of Bundi and stay on at the cliff-hanger, literally at Bhainsrorgarh, move west to the hill fort of Raas Devigarh, renovated to perfection which can be you ‘piece-de-resistance’ on the trip - celebrate, explore, visit Udaipur and end on a high ! If time is not a constraint, after being revived at Raas Devigarh, continue north-west via Bera Safari Lodge to Jodhpur – Raas, here is the ultimate in luxury and ambience. Head further north towards the beautiful terai region, no more than six to eight hours of driving from Delhi and you are will be in the land of rivers, valleys and forest. Adventure nation, elephant migration, birding haven and the ultimate Himalayan idyll. Our community in Uttarkhand is a cohesive group whose beautiful camps, lodges , homestays and retreats sum up to an interesting program. A typical program may begin in Rishikesh with adventure on the river like Rafting on the Ganges and trekking with *Snow Leopard Adventure Camps ( even more exciting if teenagers are travelling with you ), stop for a night at Aalia ( Haridwar ) to see the Ganga Arti and explore the Rajaji National park before heading to the terai forest of Corbett. Corbett staying at the Jim’s Jungle Retreat gives you the opportunity to see over 50% of the bird species of India including a variety of mammals like otters, monitor lizards, martens , elephants and the Royal Bengal Tiger. From here access the high-altitude forest of Binsar, staying within the sanctuary in Mary Budden Estate, to enjoy walks in the forest, visit kuamoani villages and Almora. The last leg of the journey will be at *Soulitude in the Himalayas or *Soulitude by the Riverside, or both depending on the time and what you wish to do. Riverside for treks and Himalayas if you wish to explore the areas around. 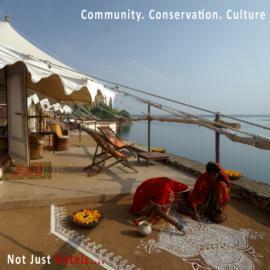 RARE has a varied collection of lodges in central India which given the diversity of the forests it covers can result in an outstanding program both for wildlife and cultural programs especially with Bhopal and Khajuraho (& Panna). A complete end-to-end program for wildlife and culture in central India would begin at Nagpur connected perfectly from across India both by flights and trains. Nagpur to Svasara Lodge (Tadoba, Mah.) is perfectly accessible to some of the best wildlife sightings and connects to Jamtara Wilderness in Pench, a stylish tented camp set in an exclusive side of the Pench Jungles. From Pench, the drive to *Reni Pani, Satpura for a holistic forest experience and onwards to Kipling Camp in Kanha ( a slightly longer drive ) to view the famous Kanha forests and medows from a conservation perspective. From Kanha one can carry on to Sarai at Toria (Panna) near Khajuraho via Bandhavgarh. The forest destinations of central India can be broken into into two smaller programs - Tadoba, Pench, Satpura, Bhopal and the other as Bhopal, Satpura, Pench, Kanha, and Panna (Via Bandhavgah).